EverGreen Farm 2012 CSA memberships are now available for purchase. Shares will be sold on a first-come, first-serve basis. Membership availability will be updated on this website. We encourage you to sign up ASAP. The cost for a membership will remain at $550. A minimum payment of $200 will reserve your membership. All final payments are due by April 1, 2012. Our goal for this season is to begin delivering produce the first part of May and go through the end of October. For more detailed information about EverGreen Farm and how our CSA operates, please refer to our 2012 CSA Sign-up Form or contact us directly. Download a copy of our 2012 CSA Sign-up Form. Sign up for has been removed. Shares are sold out for 2012. EverGreen Farm also has a Workshare Program for people who are interested in helping on our farm in lieu of paying for a CSA membership. This is for folks who enjoy gardening and will literally work for food. Download a copy of our 2012 Workshare contract and read it carefully. Workshare contract has been removed. Workshare positions are full. Also download and read the 2012 CSA Sign Up Sheet. Removed. Memberhsips are full. Complete the application page of the contract and return by mail. We hope you are all well and had a nice holiday season. Our family has slowed back into a routine again, and it's time for me to start putting together all the details for our 2012 CSA season. I'm craving fresh produce already! At the end of our CSA season last year I hinted there would be some major changes made with our farm operation. The decision making process has been very difficult. We have gone back and forth on how to best accomplish our goals, how to remain true to our ideals, and most of all how to maintain our personal health, well being, and happiness. The truth is, we have been working too hard. Too much physical labor. Too many long days. This took a toll on me personally and on our family. We've been searching for a way to operate the farm that still accomplishes great things, but respects our desire for a balanced life. Our decision is to stop selling produce at the Jackson Farmers Market and focus our efforts on running a great CSA. 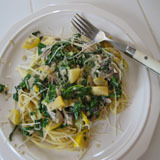 We will be expanding the size of our CSA in 2012 which will help offset some of the loss of income we've been earning through selling at the farmers market. What this will mean for our 2012 CSA members? 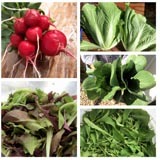 We truly anticipate that our 2012 CSA season will be the best its ever been. Why? Greenhouses! Growing in greenhouses has proven to be key in growing an abundance of high quality produce. EverGreen Farm has 7 permanent structure greenhouses! This space can now be dedicated to growing food exclusively for our CSA (and a few small local accounts). We are really excited about this extra space and the new options available for planting and growing this coming season. With less farm income, we are watching our expenses more closely than before. The cost of seeds and supplies continue to go up every year but we feel there are things we can do to keep expenses down. We have reviewed our costs for the coming season, established a fair amount we'd like to receive for our labors, and determined the amount of income the farm needs to generate this coming year. With the exception of transportation, our budget can be met without any increase in membership fees. In years past, the CSA delivery expenses were absorbed into the business because it was rather easy to offset the difference with farmers market sales. This will no longer be the case. We feel we have two options for addressing the cost of transporting the weekly shares to the Jackson and lower Star Valley. 1. For the past several years, we've had arrangements with CSA members to help deliver the weekly shares as they've commuted back and forth from Jackson and Alpine for work. Unfortunately, these people are no longer able to help. We consider this to be the best option for keeping transportation costs low. It's a win-win-win for us, the delivery person, and for CSA members. We would love to set up some type of similar arrangements in 2012, but have yet to find any interest. We are seeking an individual (or group of individuals), with a larger type of vehicle (a van or truck with an enclosed and empty bed), who is available to drive produce to the pick-up locations each week of the CSA season (May through October) in exchange for produce. We will continue to make efforts on our end to solicit this help, but are limited in our resources and contacts. This is one way our CSA members can step in to help the farm and help keep your costs down as well. UPDATE: Looks like we've found ourselves a delivery person! Yahoo! 2. The second option is to add a one time, upfront delivery fee of $50 for CSA shares being delivered to Jackson and a $25 delivery fee for shares going to the Lower Valley. (These fees will barely cover the price of gas for us to drive the food to these locations each week throughout the season.) We still feel this is a fair and reasonable price for the quantity and quality of food you will receive. We would love some feedback on these options. Any suggestions? Does the idea of an additional delivery fee have any impact on your decision to purchase a 2012 CSA share? Are these options reasonable? Unreasonable? We are looking forward to a great season! Feel free to start talking us up amongst your friends, family and neighbors. Sign up information will be posted here on this website soon. "I want you to know that I have used all of the CSAs in the area and find your produce and pick up the best by far. The variety of veggies, length of the season, and weekly newsletters are above and beyond what the others offer." "...wanted to let you know one of the benefits I have noticed with EverGreen produce is that [it] lasts much longer. It makes me realize that the 'fresh' produce I bought at the grocery store was probably over a week old when I bought it. Keep up the good work." "I am very impressed with your offerings. You do good farming - a high compliment from and old Illinois farm girl!!"